​Servicing All of Milwaukee & Southeastern Wisconsin with Healthy Snacks and Drinks! As an affiliate of Healthier 4U we provide the ultimate vending experience in the Milwaukee and Southeastern Wisconsin area! They don't stock the products we want! They don't stock the machine on a regular basis! The machine doesn't consistently vend product! The machine is old and ugly! The machine only accepts cash! I want to use my Debit/Credit card! The prices are way too high! We've remedied ALL these issues of "Traditional" Vending! Our Russ Darrow H4U Family Members! ​No Fee, Premier Vending Service for Your Location! ZERO Hassle Vending! We do all the work! CREDIT & DEBIT CARD Payment Methods! RELIABLE Vending -- Every Time! We are a local vending company in Milwaukee servicing businesses, schools, hospitals, hotels and other venues in our hometown. If you have employees or patrons, we may be able to help your location as well! If you are dissatisfied with your current vendor, or are looking to supplement your available vending selection with healthier snack and drink options, we can help with that too! Make sure to visit our Qualifying Page to see if your location is eligible for your own Healthier 4U machine! Our Gracie Jiu-Jitsu Milwaukee H4U Family! Provide easy, quick and consistent dependable healthier vending transactions for all of our customers. We do this by employing only the most reliable vending equipment made in the USA. Multiple payment options makes vending from our machines easy! We provide the ultimate in on-site convenience for health conscious consumers and employers wanting to promote wellness. We give the BEST service by offering a customized and remotely monitored inventory -- no more empty selections! Make sure to download our FREE color brochure to see how easy it is to get amazing service at no cost! See if YOu Qualify for our Free Service! ​You know how many traditional vending machines work -- you put in money and they don't consistently vend your selection. It's frustrating and a waste of time and money! Many traditional machines offer one way to get your product. Cash. No cash on hand = no transaction for your employees or patrons. We've sought to eliminate those problems by providing the newest and most reliable vending technology. Our "I-Vend" technology makes sure our patrons get the product they select! That means far less hassle for the business and happier consumers! In addition all our locally placed machines offer cashless payment. That means debit, credit, Google Wallet and Apple Pay is accepted in our machines! 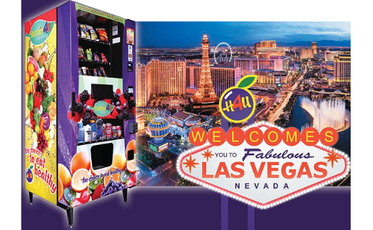 ​So take a moment to contact us today to see if you qualify for a FREE Healthier 4U Vending machine for your location! See Our Advanced Vending Machine Benefits! Got Questions? Good, Because We've Got Your Answers! Q. How much will this cost? Who services the machine? A. There is NO cost to your location if you qualify! If you do not qualify, you may opt to lease our machine. For qualified accounts, we will service your account and make sure that your machine is stocked with quality, healthier selections. Your machine's inventory is remotely monitored, so there will be no long periods of empty selections – that is our GUARANTEE to you! Q. Can we pick what we want in our machine? A. Yes! You will have the option to make product selections. After placement, snacks and drinks are frequently rotated to find the most suitable selections for your location. We want you to love your new machine and the service we provide! Q. Does your machine take credit and debit cards? A. Yes! We’ve found that approximately 30-40% of all vend purchases are made via cashless transactions. Our machines offer payment flexibility for your employees/patrons with a credit and debit card reader. In addition, our machines support Google Wallet and Apple Pay! Q. How often will you be servicing the machine? A. That depends on your location and machine usage. The average is once is a week. Your location’s inventory will be remotely monitored, so we will arrive when your inventory gets low! Q. We’ve had issues with our previous vendors – the selected product frequently doesn’t vend. How reliable is your machine at vending selected products? A. Our machines use “I-Vend” technology that knows when a selection has vended properly – or not. If a selection does not vend, the customer will be prompted to make a different selection or press the “change” button to receive their money back. Q. How will you price the products in the machine? A. We are NOT going to price gouge you! Our prices will be in-line with local convenience store prices (please keep in mind we have to include tax into our prices.). Q. How long will it take for us to get our machine? A. If we are purchasing a new machine for your location, the purchase and shipping process takes about 2 weeks to complete. If we are moving a machine to your location, it will only be a matter of days. Most machine deliveries occur on Wednesdays or Thursdays. Begun in 2011, Healthier 4U has over 3,000 machines across the United States with over 450 local affiliates! Healthier Solutions Now is proud to be a local affiliate here in Wisconsin. Healthier 4U is headquartered in sunny Las Vegas, NV. ​If you'd like to learn more about Healthier 4U Vending, just click on the logo below! CONTACT "Healthier Solutions NOw," Today! Visit Us Soon on Facebook!